To read about full-sized trains and locomotives, go here. Please Remain In Your Seats: Recently, I swapped out two of the train sets on my O-gauge model train layout. On the lower level, I replaced the Pennsylvania Railroad T-1 steam locomotive and passenger consist with the PRR 2-8-8-2 Mallet pulling a long freight consist, including but not limited to Entemann's vat car, Tastykake boxcar, Bonomo's Turkish Taffy boxcar, Bakelite Plastics bulk hopper car, Gulf Oil tank car and Sunoco Tank Car. 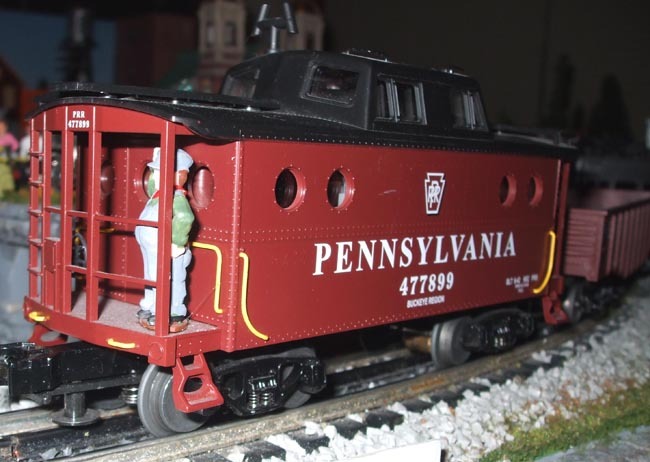 On the middle level, I replaced the Pennsy GG1 electric locomotive and silver Congressional passenger set with a Consolidation 2-8-0 steam locomotive pulling a set of heavyweight-style PRR Tuscan passenger cars. When I purchased these MTH-made coaches, I detailed the open observation car with silver paint on the railing, gold finials, gold-trimmed rear lanterns and installed a drumhead made from a metal PRR lapel pin. I also installed figures in the coach seats of all coach cars and on the observation platform. Unfortunately, some of the seated passengers are prepainted figures made from a rubbery plastic. I glued them to the seats using a dollop of Amazing Goop on their bottoms but that, apparently, wasn't enough to secure them. Over the years, some have come loose and are upside down or laying on the floor. I disassembled all the cars and this time used a lot more Goop so that their backs and legs are also glued to the seat surfaces. I also gave them more time to dry before replacing the coach roof and used a hot air gun to accelerated the curing of the glue. Trouble In Toyland: Hornby Hobbies is a UK-based toy and model conglomerate. The original company was founded by Frank Hornby in 1901 and focused on toy trains. Today, the firm owns a number of model trains and railroad accessory brands (Hornby, Lima, Jouef, Arnold, Rivarossi, Lyddie End Scaledale), model and toy vehicles (Corgi, Scalextric, Pocher), as well as model aircraft and accessories (Airfix, Corgi, Humbrol). In 2015, Hornby began a series of declining financial results. The major reason behind the decline, Hornby declared, was two-fold: the decline in the number of collectable customers (due to old age or death), and a lack of interest in modeling as a hobby in light of internet activities. After the stock price dropped by more than 50% in a year, Hornby declared that it planned to cut more than half of the toys it made, after discovering that it generated 90% of its profits from only 50% of its range. I'm shocked that it took Hornby management so many years to figure this out but I wouldn't be surprised if - based on the venerable 80/20 rule - that 80% of their profits came from 20% of their offerings. This means that Hornby Hobbies would have to raise all prices by more than 25% just to break-even. Maz Wooley of Model Auto Review noted that the company recently reorganized with new management, In the last 6 months, revenue fell from $29.2 million to $22.7 million year-over-year - a drop of over 22%. Furthermore, the company's losses now total over 20% of net sales - a very alarming figure. Lyndon Davies, owner of Oxford Diecast, is Hornby's new Chief Executive Officer and plans to revitalize the company by revitalzing "the European sales, which have been falling over time, by spending more time identifying what the customer wants." The company also plans a stock sale, proceeds of which will be used for product development and for a partial acquisition of Oxford Diecast. Haulin' Gas: Gulf Oil was established in Pittsburgh around the turn of the 20th Century and was the source for much of the Mellon family fortune. Gulf built its first Philadelphia refinery in 1905 at Girard Point in South Philly and was a well-known gasoline brand in the area. Grades were subregular Gulftane, Good Gulf regular, Gulf No-Nox Ethyl premium and later, Gulf Super Unleaded. Aging Hobby: According to a Wall Street Journal article, the "average age of the National Model Railroad Association's 19,000 or so members is 64, up alarmingly from 39 in the mid-1970s." 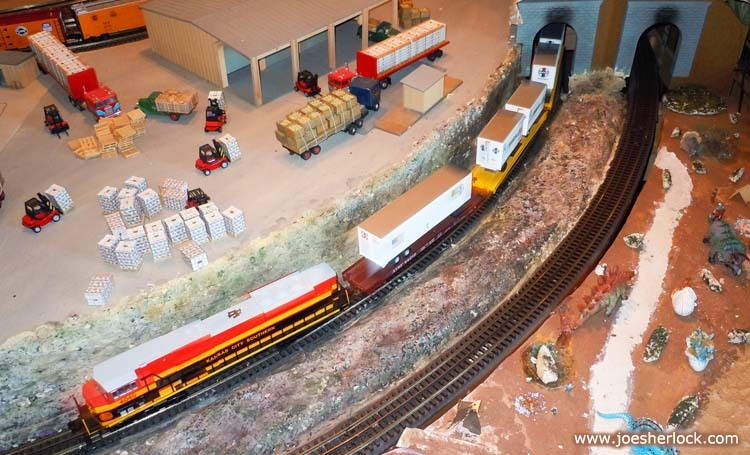 "The Western Pennsylvania Model Railroad Museum, near Pittsburgh, promotes the hobby by offering a 20-hour Model Railroading 101 course each winter for $60." Tank You: Lionel Electric Trains has offered Sunoco tank cars since the 1930s. On the three-level train layout built by my dad in 1947, the middle level had a steam loco pulling a freight consist. One of the freight cars was a post-war, silver double-dome Sunoco tank car. This three-dome plastic one, which I run occasionally on my present model train layout, was first introduced in 1953. I picked mine up at an area train swap meet in 2002 for $15. It is marked "built by Lionel." 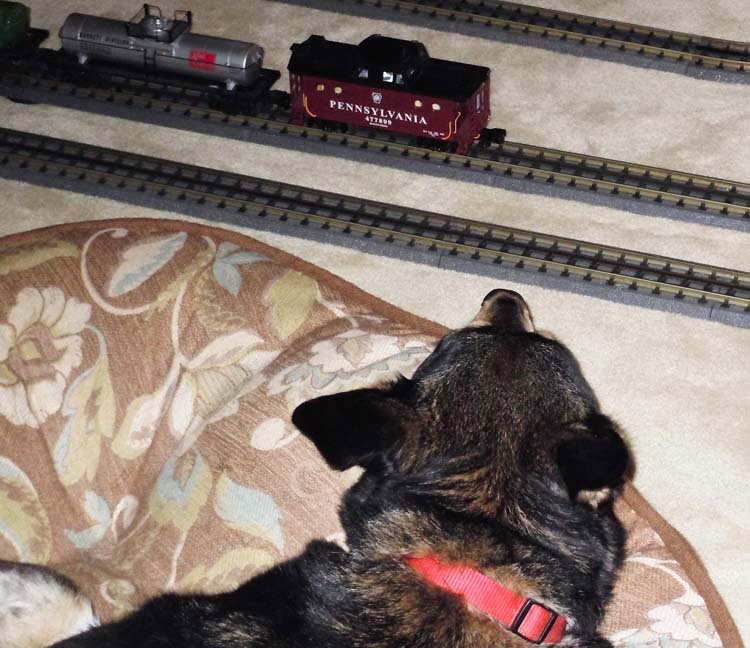 New Railroading Fan: My daughter got a new dog recently. Like Lucy, her late canine predecessor, Sadie is interested in looking at the trains run on my O-gauge model train layout. Final Boarding Call: Caboose Hobbies in Denver, reputedly the largest model-train store in the world with 18,600 square-feet of space, shut its doors for good on Sept. 11th. 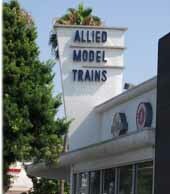 Rail Closure: Allied Model Trains, one of the Los Angeles area's oldest and largest model railroad hobby shops, closed in July 2015. Allied originally opened in 1946 and was last located in Culver City, CA. My good friend Ray Lukas and I visited Allied during our Great California Adventure. It was an impressive place with lots of merchandise and interesting displays. Trolley Talk: The Philadelphia PTC "talking" trolley for my O-gauge model train layout has been repaired and arrived last week. Everything now seems to work. It makes all the proper trolley sounds, with a Philadelphia-accented voice calling out stops, urging passengers to "please move to the rear" and reminding them to "take all newspapers and personal belongings with you." The faux motorman also exhorts exiting passengers to "Have a nice day! ", which never happened during the many years I rode public transport in the so-called City of Brotherly Love. There are also the sounds of air-operated doors opening, bell ringing, brakes being applied and released, coins and tokens falling into the fare receptacle, etc. The little trolley is programmed to stop and start at regular intervals and the stops can be customized to fit specific locations on one's train layout. The trolley had stopped working earlier this year; shorting every time I turned on the power. This MTH-made trolley car is an obsolete model and is no longer made. So, I sent it off to the The Train Shack, an Authorized MTH Repair Center in Burbank, California. Farewell: Weaver Models, makers of O-scale trains and Scalecoat model railroad paint, will be closing its doors at the end of June 2015. I own a Weaver covered bulk hopper car, painted red and white, marked 'Bakelite Plastics'. It is a limited-edition, custom-run model made for Petersen Supply Co. of Portland, OR. Bakelite is a thermosetting phenolic plastic, made - until recently - by Union Carbide. (It is now produced by Momentive Specialty Chemicals of Ohio.) Bakelite has been designated a National Historic Chemical Landmark by the American Chemical Society in recognition of its significance as the world's first synthetic plastic. It was developed by Leo Baekeland in 1907. Bakelite is still used for wire insulation, brake pads and related automotive components as well as other electrical-related applications. Weaver Models, located in Northumberland, Pennsylvania, was founded in 1965. The firm made most of its products in the U.S. The current owner is retiring and was unable to find a buyer for the business. 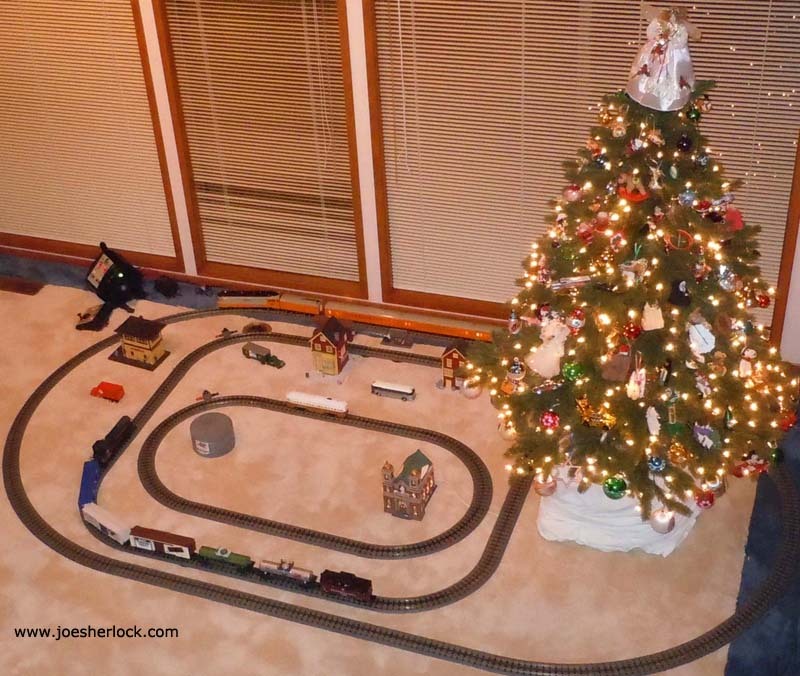 Christmas Trains - 2014: Due to my current health situation (cancer surgery plus six months of chemotherapy), I lacked the strength/stamina to put up the usual train layout this year. 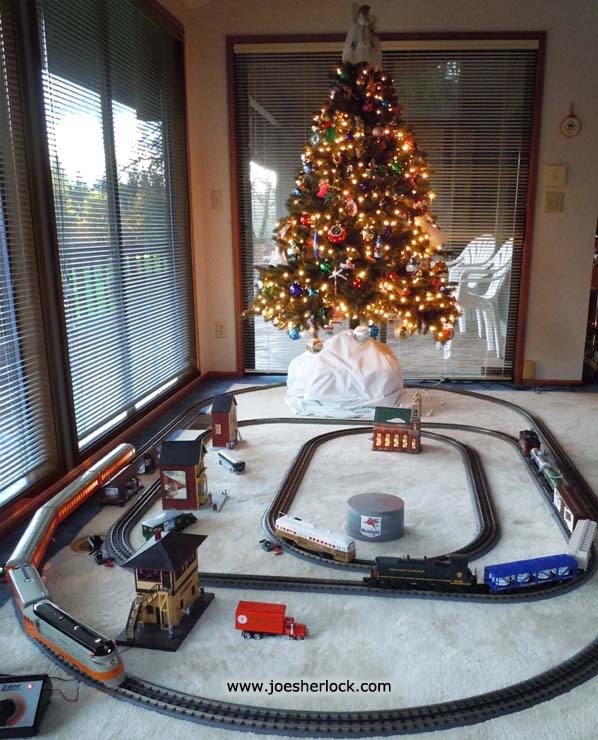 Instead, I put up three loops of track on the living room floor by the Christmas tree. Everything is now working: the big outer loop is for my Lionel Hiawatha streamlined passenger train, the middle loop is for a Pennsylvania Railroad diesel freight set and the small inner loop is for a trolley car. I did a lot of bending, kneeling and stretching to assemble the track, hook up the power transformers and assemble the trains on the tracks. And, boy, was I sore for the next couple of days. Lionel Connection: Singer Frankie Valli wrote, "My dad, Anthony (Castelluccio) ... had been a barber, but by the 1940s he was working for Lionel Trains. 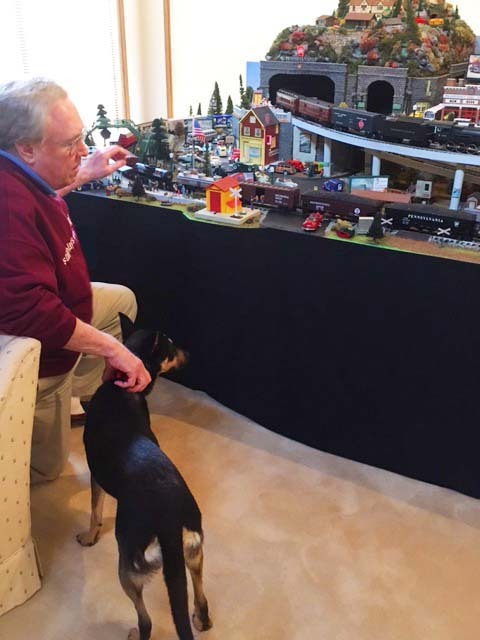 He started as an assembly-line worker in their plant in Hillside, NJ, but he soon became responsible for designing model-train displays in store windows. He was a creative guy." End Of The Line: After nearly 80 years in business, Aristo-Craft Trains will cease operations by the end of 2013. 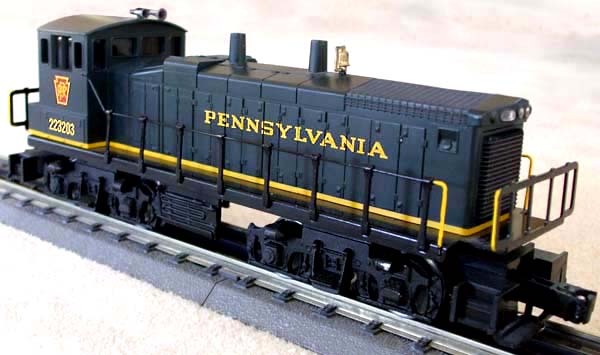 The G-scale and O-gauge model railroad manufacturer is based in Irvington, N.J.
"Since 1935, we have provided service and innovation to the hobby industry," said the Polk family, owners of Aristo-Craft. "In this latest downturn, we cut back staff to the minimum required to survive. Then the government battle over the debt ceiling drove the consumer market down even further." Aristo-Craft had been growing steadily until 2008. Like many hobby manufacturers, Aristo-Craft fell on hard times when the Great Recession hit. The company managed to stay afloat but fell into "debt that was unsustainable." The higher cost and space requirements of larger-scale trains had also depressed Aristo-Craft's market share, according to the company. Here's the other problem: toy train enthusiasts are getting older and kids are getting into trains at too slow a pace to replace the number getting out. 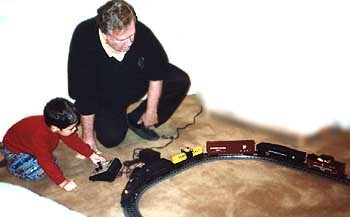 Additionally, the rise of video games and related electronic pursuits has negatively affected the model train business. Interest in toy trains dwindled in the 1970s but picked up again when many baby boomers began collecting electric train sets again as deep-pocketed, free-spending adults during the 1980s and '90s. "A lot of our business is baby-boom men basically rekindling their memories. That could be a problem, as far as those guys going away," said Andy Edelman, vice president for marketing at MTH Electric Trains, maker of Standard Gauge, O-gauge and HO-scale trains. 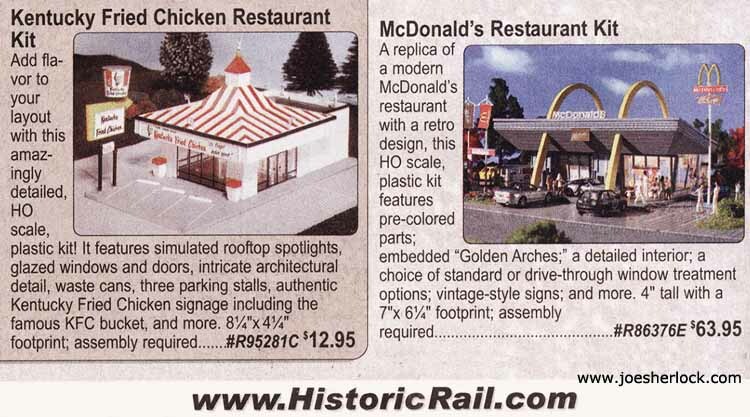 Scale Disparity: Looking at a recent sale flyer from a train shop, I was shocked by the price spread between two HO scale buildings. 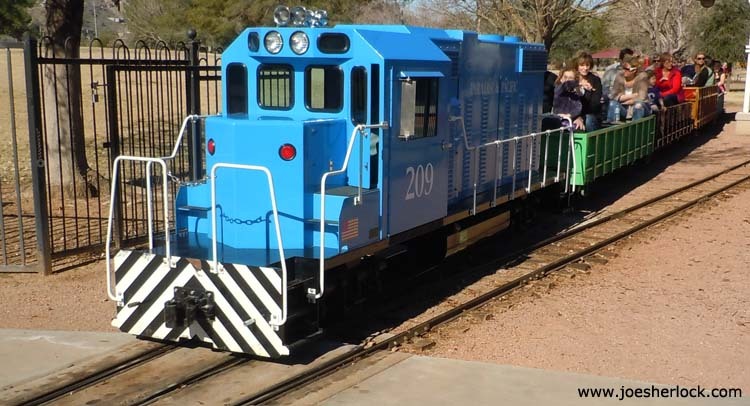 Just Not The Same: McCormick-Stillman Railroad Park in Scottsdale, AZ has changed much since we last visited in 1991. 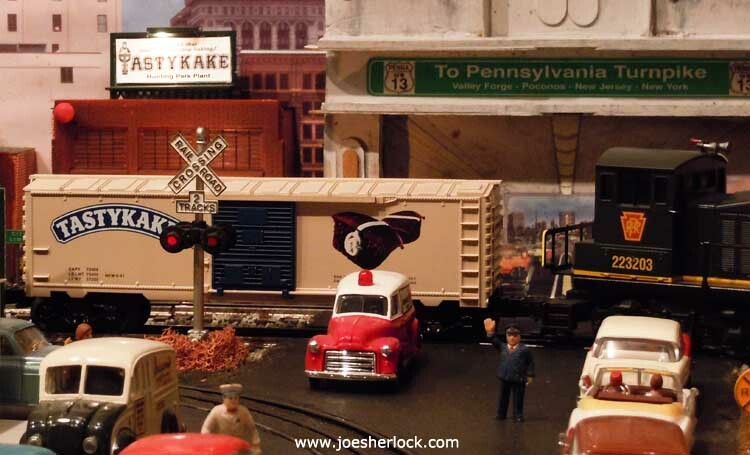 Tasty Christmas: My daughter gave me a wonderful Christmas gift: an O-gauge Tastykake boxcar offered by the Atlantic Division of the Train Collectors Association. Only 100 were produced; the car was manufactured by Lionel and decorated by Weaver Models. The Tasty boxcar has die-cast, fully-sprung trucks and operating couplers. More toy train photos and stories are posted here.